Again, that was over a month ago. Now, with the recent furor over this fast food chain and its ties to anti-gay groups, those feelings of mine have expanded. Now, I came into this like, I'm sure, most people: through Facebook and Twitter. That being the case, my opinion was heavily influenced by what the people I was friends with or otherwise following were saying. For me, since I have a wonderfully eclectic range of Facebook friends, that meant my news feed was populated with alternating cries of "Support free speech!" and "Down with homophobia!" Curious, I did a little bit of research. (A special thanks to the fine folks at snopes.com, as without this article I wouldn't have known where to start researching this). From what I can tell, this is essentially true. According to some fact checkers at equalitymatter.org (admittedly, a biased site), Chick-fil-A has a charitable wing called WinShape that handled nearly $2 million in charitable donations to various conservative Christian family-oriented organizations, many of which have strong ties to either the anti-gay movement as a whole or to members of the movement individually. For a more comprehensive list, click that link up there. You know the one. This is where things get a little more fun. Chick-fil-A withdrew a line of Jim Henson-based toys from their substandard chicken sandwich meals because of safety concerns. A few days later, the Jim Henson Company issued a statement that it had severed ties with Chick-fil-A because of the whole anti-gay thing. Who's telling the truth? 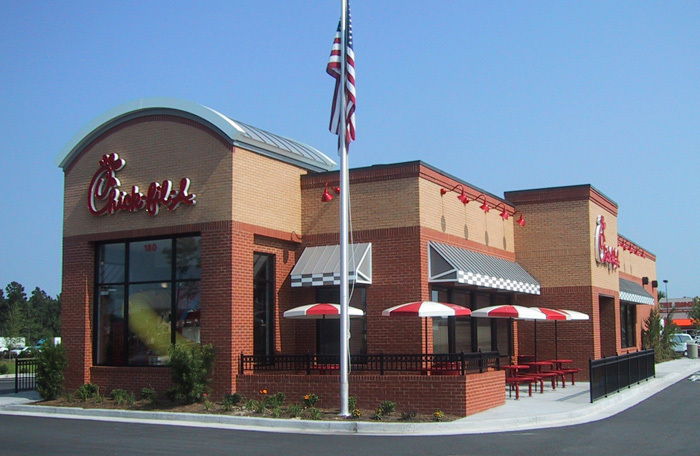 According to the Daily Dot, Chick-fil-A then issued another statement saying, basically, that both companies are. That's...less of a controversy than I was hoping for (I would have loved to see Kermit and Gonzo testify before a jury in a libel case, for instance), but still, an interesting turn of events. Again, according the the Daily Dot article I referenced mere moments ago, this is true. Of course, the mayor's attempt to do so will probably be as futile as my current attempt to avoid describing this particular event in colorful terms. Cockblocking. The colorful term was cockblocking. So: that's my exhaustive (cough I spent five minutes researching this and twenty writing it cough) report on the Chick-fil-A situation. Do you know more about this than I do? Do you have a different take on these events? Are you just smarter than me and want to prove it? Please, comment below. So my question is, if Chik-fil-A is substandard, what is up to standard? Do you demand three pickle slices? Romaine lettuce? Spicy brown mustard? What does it take to please you, man? Through this whole CFA mess, one thing has come to light. People are willing to support free speech by buying ... chicken? Yeah, I've had the most trouble understanding how "CFA day" was meant to support everyone's first amendment rights while simultaneously raising yet another wall between the Christian and LGBT communities. I read a ton more and cannot seem to find any of them at present. Also, Chicago and Philadelphia apparently both have bans on CFA. I actually read that article too; I liked it. I wanted to use it in my post, but I didn't want to go too far into the religious/political parts of it (other than my little wisecracks, of course). On point number 1, contributions to anti-gay organizations, most of the ones listed as anti-gay are family oriented types which promote the idea that marriage should be between a man and a woman. Hardly a novel concept. Exodus International's vision is much like that of the LDS Church concerning SSA. It seems though that one is considered anti-gay if he or she disagrees with any one of the gay community's agenda, no matter how well they treat gays in their personal lives. Thanks for your comment! I'll be the first to admit, I didn't look too far into the different organizations, though the impression I got was certainly in line with what you said in your first paragraph. Also, in terms of admitting my own biases, I should say that I err more on the side of favoring gay rights, though I tried not to be too politically overt here (other than a cheeky picture caption or two), and I certainly welcome alternative viewpoints. While I agree that the term "anti-gay" is pretty inflammatory (since in this context it really seems to mean "anti-gay-marriage" rather than "anti-gay-people"), I personally feel that the label "gay agenda" is a little misleading. There's a great TED talk by LZ Granderson on the subject (found here: http://www.ted.com/talks/lz_granderson_the_myth_of_the_gay_agenda.html). It's a little long (about 17 minutes), so I understand if it's hard to find the time to sit down and watch it all, but the main message is that what most people call the "gay agenda" is actually just a push by the gay community for the rights heterosexual persons enjoy under the Constitution. Anyway--consider this my way of continuing a civil discussion, not a flame war! I think my favorite view on this issue was given by Jon Stewart. Trying to ban a law-abiding company because your view of marriage differs from one of their CEOs is kind of against the First Amendment. Ah, Jon Stewart. Yeah, for me, I think there are things on both sides of the issue that are pretty silly. Also, the Snopes article is far more even handed than I was--please, read it! We each have to make our own moral decisions about boycotts. In my lifetime I have supported a number of them. In the 1960's and 1970's I did not eat table grapes. I grew up in California's Central Valley and I witnessed how farm laborers were badly treated and uner paid (my favorite was a San Joaquin County Labor Contractor who turned off the drinking water at his labor camp on weekends and sold beer at 50 cents a can. His punishment? None.) That boycott was easy to justify. In the l970's I came into a small inheritance. After reading about Steve Biko, Desmond Tutu and Nelson Mandela it was also a no brainer as far as following the boycott and refusing to have any of my investments be in South Africa. I found the racist, sexist and homophobic comments by Rush Limbaugh so egregious that I avoided buying anything from the companies that sponsored him, a personal boycott, if you will. I am unrepentant Union Man, I will not cross a picket line. I will not shop at a business where the workers are on strike. There are generally two moral components of obeying a boycott or not: you are trying to change the behavior of the group being boycotted or the monetary support you are in effect giving is, in part, being used to fund activities that you in good conscience cannot support. I have friends and former students that have been hurt by type of anti gay vitriol spouted especially by Focus on the Family and the Family Resource Council, both funded by money from Cick Fil A, that I certainly want to do nothing to support them. Its not the political position on SSM that is a motivator. It is the venom and hatred. Certainly I do not expect to change their beavior. Today I found it interesting in Priesthood that the support for the "Chikin" outfit was so high. Especially when I told them of the anti-mormon rhetoric of Focus and FRC leaders as well as the reality that the Fellowship of Christian Atletes generally do not let Mormons in because we are not "Christian." C'est le vie. The real sacrifice for me in this boycott is not the sandwiches, but rather the waffle fries. It was really funny to hear academics talk about the protests this last weekend. Obviously at the academic theatre conference, feelings about gay marriage were pretty predictable; however, there was a lot of heads in hands over the whole thing. Quite a bit of criticism of a youthful anti-intellectual left that leaps to protest without always critically thinking about its own politics, tactics, or methodologies. One scholar discussed the rise of activist-ism.